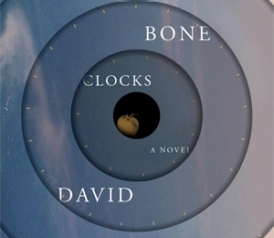 Today I am recommending The Bone Clocks by David Mitchell. Mitchell’s latest novel is a genre-bending epic spanning sixty years, about the people whose fates are altered by an ongoing war between immortals. This one is going to make a lot of “Best of 2014” lists. The book grew on me a lot after I was done reading it. I like that Mitchell is not afraid to play with the conventions of novel writing. The story begins in 1984 England as fifteen-year-old Holly Sykes is running away from home. Holly sometimes sees visions, “daymares,” or hears voices: “The Radio People, I called them, ’cause at first I thought there was a radio on in the next room. Only there never was a radio on in the next room.” Holly’s strange and frightening visions signify that this is not the mundane world it seems, but a fantastical version of it where reality can be distorted. She witnesses a decisive battle in a war, an event that neither she nor the reader can comprehend. By the end of the first section, Holly’s memory has been erased and her younger brother has disappeared, which will haunt her for years. Each following section jumps forward several years and introduces a new voice, with Holly as the linchpin connecting it all. This episodic structure is reminiscent of Mitchell’s novel Cloud Atlas, but with immortals, psychic vampires, and reincarnation, this story wanders further into the realm of fantasy. The characters’ voices, ordinary people caught up in the Immortals’ struggle, anchor the fantastic and give it meaning. Hugo Lamb is a reprobate college student who is offered a chance at immortality. Ed Brubeck, a war journalist and the father of Holly’s daughter, describes the futility of the present-day war on terrorism. Crispin Hershey is a well-known author whose star is falling, and his cynical take on the literary community is darkly funny. In the penultimate section, one of the Immortals reveals to Holly what happened to her as a teenage runaway, and the final outcome of the war is decided. The denouement, set in a near-future world destroyed by climate change, is the most difficult to read. Despite all of the incredible events that have shaped Holly’s life, the all-too-real end is depressingly bleak, but not altogether hopeless. An episodic mind-bender that will appeal to readers of fantasy and literary fiction alike.